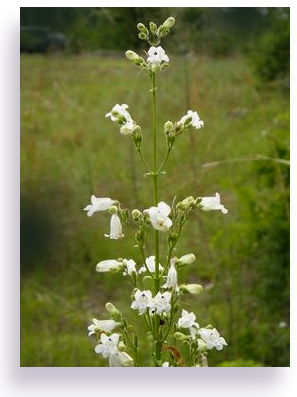 White beardtongue, or Penstemon multiflorus, is a lovely little nodding relative of foxglove. Found throughout the state, white beardtongue is grown by those who cover native landscaping in large clumps, where it blooms almost continuously from early spring well into fall. 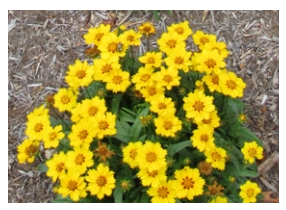 It grows well in our sandy soils, and does not require any fertilizng once established. It prefers to grow on the edges of meadows, where it receives sun to bright sun, but protection from direct sun of August afternoons. Drought tolerant once it is established, water deeply once or so a week until the roots take to the soil. A bit picky about it&apos;s location, just work around this until you see that it is happy. Great for the back border of a perennial garden, it can grow to 3 feet tall. Blue Flag Iris, or Iris virginica, is a great plant to add to the edge of a pond. Enjoying swampy conditions, make sure to keep it&apos;s feet moist. Can take drenching rains where areas of your yard puddle for a few days. 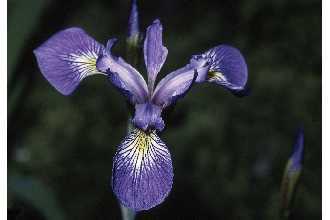 Think of that when planting of bed of Blue flag iris. It will naturalize the plot you place it in, so good for an informal looking garden. Thrives in our poor Florida soils. 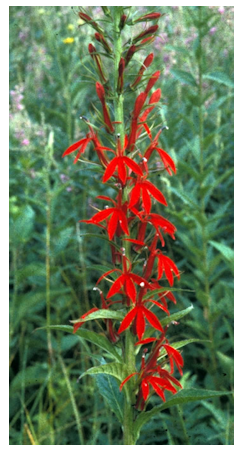 Lobelia cardinalis attracts many species of bees and butterflies. The tall panicles can grow to heights of 3 feet, so good for the background of a perennial bed. The bright splash of red color looks great with shorter Beach Verbena plants set in front of them. Good in Florida soils. It does prefer partial shade for the best growth. Fertilize with fish meal in spring. 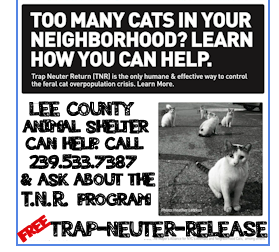 They will naturalize within a yer or two with weed control applied. A hardy plant, lobelia cardinalis will come back from the roots if frost threatens. Flowers appear in spring and last through summer. Also likes moisture, so plant where you can reach it with a waterhose or a sprinkler system. It can also withstand the brief flooding of a patch of ground that stays saturated after heavy rains. Lanceleaf Tickseed or	Coreopsis lanceolata grows to only 1 foot in height, but it bursts into bloom with dozens of showy, bright yellow flowers in late summer. It can tolerate dry conditions once it becomes established. Clumps of this plant look good in front of the taller white beardtongue. Loved by butterflies and bees, a great plant for butterfly gardens. Very cheerful. Grow in a moist situation, this plant likes water, but not standing. Protection from the hot afternoon sun will produce the largest bloom set. Sandy, loamy soil will also help. Grows to 1 foot tall. Mistflower, or Conoclinium coelestinum is a hardy perennial that does well in partial shade to sun with protection from hot afternoon sun. After it establishes, this groundcover will take over and cover the area you planted it in full show of these lovely, lacy and delicate looking lavendar flowers. Butterflies and bees love the nectar. Grows to only 1 foot in height. It only needs average watering, and after it is established does fine with the watering you supply to your perennial beds on a weekly basis. This eupatorium is actually very beneficial to your male butterlies, as it is a source for the pheromones they need to attract a female butterfly. 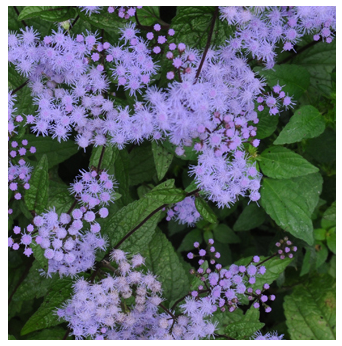 Also called Blue ageratum. 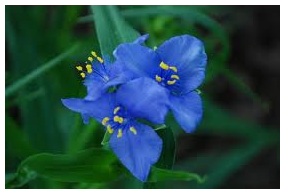 Spiderwort, or Tradescantia ohiensis, is one of my favorites. I will not allow my husband to mow one down. Growing only to 12 inches, maybe 16, this lovely little brillant blue flower with the deep yellow &apos;eyes&apos; (that are actually pollen on the stamens)&semi; is a great addition to a native perennial garden. Blooming mostly in spring, they attract honeybees in the morning hours of the day. Slightly moist soil makes for brighter blooms. Use well mulched up fish fertilizer in late winter to coax them up in droves. Will naturalize and can be transplanted if you do it in the early morning hours before it gets too hot. Delicate flowers will wilt and close in afternoon sun but return each morning. Prefer a shady setting. As it grows on, it will begin to form clumps. A lovely woodland looking plant, perfect for informal gardens. This entry was posted on April 17th, 2012 and is filed under Garden.